It looks so refreshing! I was wondering if u know how to make a virgin one? Thanks. Just leave the alcohol out? How did you keep the raspberries from sinking to the bottom? Thanks for asking Kathy… if you look closely you’ll see that there are ice cubes top to bottom. We used the weight of the cubes to hold the berries & mint in place. I love, that you haven’t muddled the raspberry. 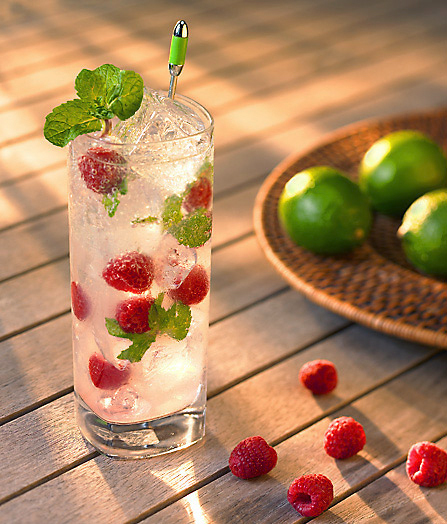 IMHO this would worsen the texture [a mojito supposed to be liquid, fresh and effervescent]. To highlight more the raspberry taste, few drops of raspberry eau de vie [or if you use other fruit, respective other eau de vie] could help. Great suggestion….and it occurs to me a drop or two of Chambord could be lovely! In fact, I might have to try this tomorrow! I saw pints of blackberries the other day that were luscious looking and priced at 2 pints for $1! I think a Blackberry Mojito is an inspired idea! This is the prettiest drink I have ever seen!